Milk thistle seed we threshed and winnowed by hand at the workshop Nov 3. I still have to clean it. I have wanted to grow and harvest small grains for years, but they present some fundamental challenges for the grower. In this post I’ll discuss harvest challenges, leaving land preparation, seeding, and weed control for later . Typically small grains are harvested in late summer or fall during dry weather. In the Maritimes, it is hard to find a few days in a row when the weather is dry enough to harvest ripe grain. Ideally, the soil would not be wet (which it usually is in late summer). Heavy harvest equipment would compact poorly drained or wet soil. Normally small grains are harvested with a combine. A combine is a very large machine that cuts the grain, threshes it, and winnows it. A phenomenal invention! But to buy one is prohibitively expensive for a small farmer. The other option is to hire a custom combine operator to come to the farm and harvest your crop. Sometimes this works, but it is heartbreaking to have a beautiful field of ripe grain and good weather to harvest it, but no custom combine available at the time you need it. There is such a narrow window of time for harvest, and everyone needs the combine at the same time. What is a practical, low-cost way to harvest a small field of oats or barley or wheat? 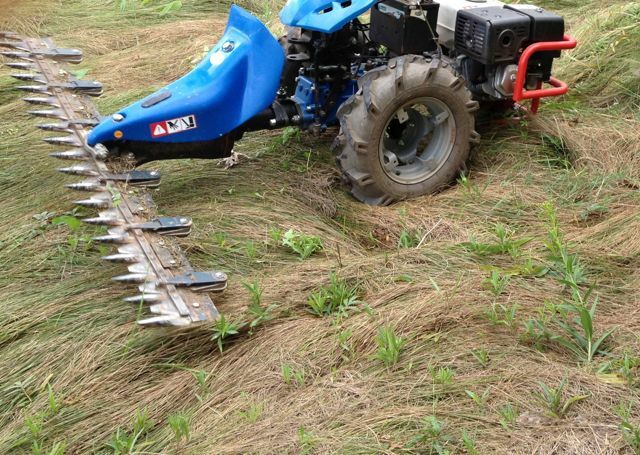 It can be cut with a scythe or a sickle-bar mower, and windrowed in the field. 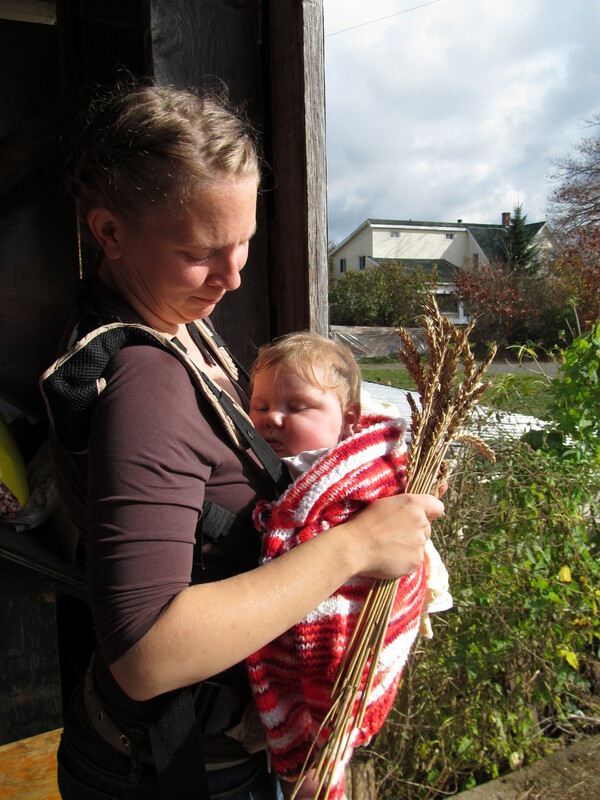 Or it could be gathered in bunches, tied, and stooked in the field. If it looks like it is going to rain, it could be brought in to a barn and spread out on the floor, or the stooks could be brought into the barn to finish drying. Bringing the whole plant into the barn allows more flexibility in terms of threshing time, but it also takes a lot of room. A portable thresher can be shared among farms. It can be set up on dry days to thresh grain. Since the grain is inside, sharing is easier and more practical than sharing a combine. Heliotrust has ordered a portable thresher from the Netherlands for this purpose. Please get in touch if you would like to use it. We have also used a small ‘plot thresher’ for small batches of grain. It knocks the grain from the head by beating it. The grain then needs to be separated from the chaff either by winnowing or putting it through a grain cleaner. 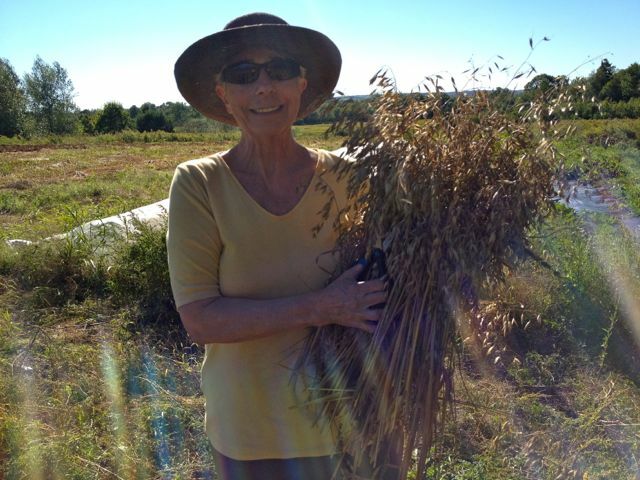 I have used winnowing a lot! For small batches, it is kind of fun and beautiful on a nice breezy day. I pour the grain/chaff mixture from one container to another on the ground, and let the wind take any lighter bits away as the heavier grain falls into the container on the ground. It has to happen several times to do a good job. For larger batches of grain, a grain cleaner or fanning mill can be used. It is quite common to see these in old barns. Screens with different sized openings are used to separate grain from chaff or grain from weed seed. 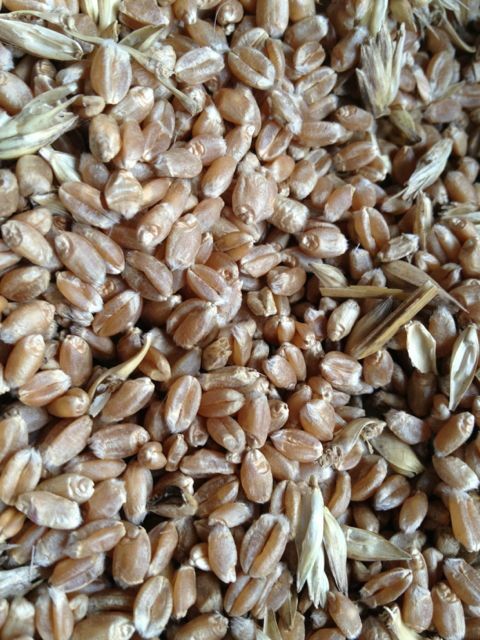 The act of harvesting grain grown on your farm is a form of seed selection. You are by default selecting seed from plants that grow to maturity in your location, and with your growing conditions. However, we can take this selection process one step further by grading the harvested seed. This is the process of cleaning seed using screens that allow only the large seeds through. By selecting the large, plump, healthy seeds, we are improving the crop’s health and vitality over time. Seeds that have been affected by disease are often shriveled or smaller, so taking them out of the grain you save for seed is an important step to increasing the crop’s disease resistance. This question was floated at the workshop and I didn’t answer it fully. So I felt a responsibility to write about it here. Spring Galician seed. Looking up close we see seed of different sizes and shapes. This seed still needs to be cleaned and graded. 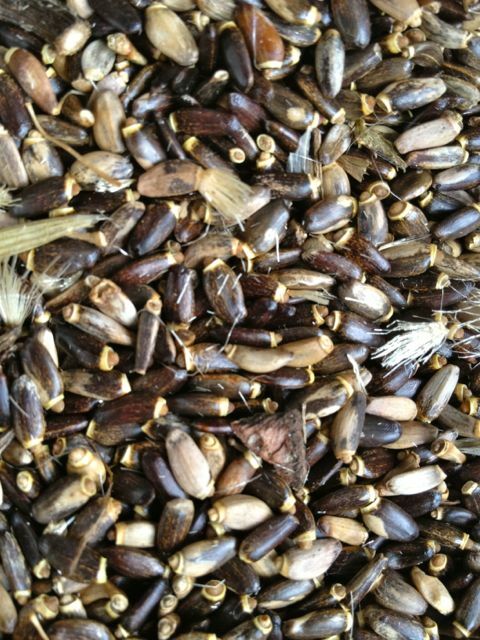 This entry was posted in seed saving, wheat and tagged heritage wheat, milk thistle, seed selection, thresher. Bookmark the permalink.